A meal delivery initiative for victims of the natural gas explosions and a bed-building project are among this week’s community news items. Team members at the $8.6 billion Digital Federal Credit Union in Marlborough, Mass., volunteer their time to package 32,000 meals to benefit area food pantries in partnership with The Outreach Program and End Hunger NE on Sept. 18, 2018 at the Marlborough, Mass., operations center. Each day, 41 million Americans are unaware of where their next meal is coming from. With the help of Digital FCU, The Outreach Program packaged their 26 millionth meal. 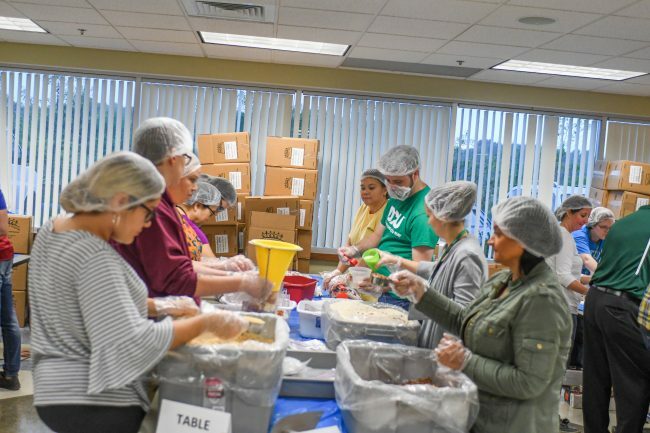 In support of The Outreach Program’s mission of ending hunger and enriching lives, Digital FCU team members happily formed assembly lines inside their Marlborough operations center, where they prepared and sealed packages of macaroni and cheese, minestrone, beans and rice, and apple cinnamon oatmeal. Digital FCU sponsored 20,000 meals and the remainder were sponsored by Old Sol of Manchester, N.H., and the Wellesley Congregational United Church of Christ. The credit union distributed a portion of the packaged meals to Lawrence, Mass., area food pantries to support individuals and families displaced by the recent Merrimack Valley natural gas explosions. Meals were also donated to the South Middlesex Opportunity Council, which will be distributed to local communities across the Commonwealth of Massachusetts.